See, over to the right side of the house? That is the porte-cochère. Notice how its roof is different than all the other roofs? That is because…it has a new roof!!!!!!!! 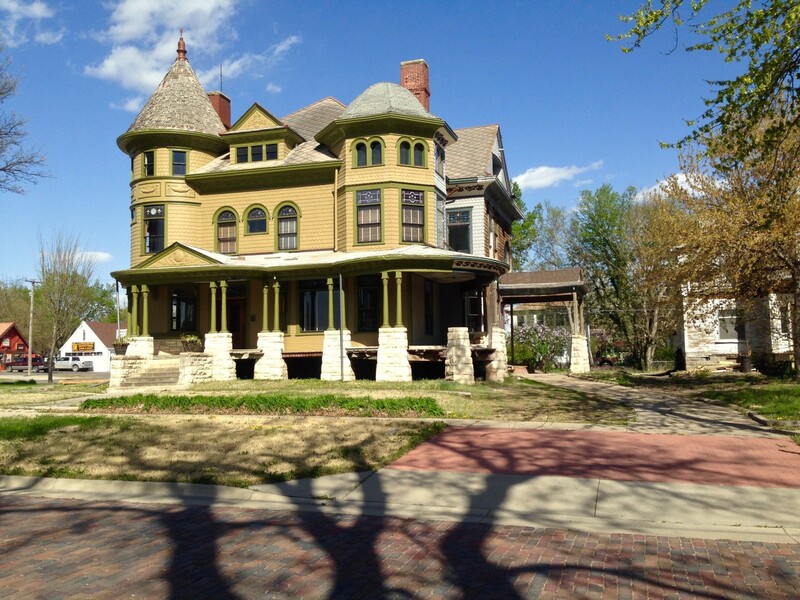 This is the first phase of replacing all the secondary roofs on the house, as part of the Kansas Heritage Grant. Soon, the main porch roof will be done, the octagon tower roof, the rear extension, and the (I am breathless with anticipation) turret roof!!!!!!!! For the first time in a century, all the secondary roofs will match! The main roof is 1920s cementitious tiles. These tiles will last till the end of time, so I am leaving them in place. The new roofing was selected to complement the 1920s tiles, and paint colors. The new roofing will hugely improve the appearance of the house. Whoee!!!!!!!! 2 Responses to Something New…!!!!!!!! That is great! Water getting in keeps me up at night! Congrats. What is the new roofing material going to be? Slate shingles? BTW, based on other pictures you have posted here, hexagonal copper shingles would look awesome on the octagon tower roof.